Dinosaurs, Creatures, & Breeding! – over 100+ creatures can be tamed using a challenging capture-&-affinity process, involving weakening a feral creature to knock it unconscious, and then nursing it back to health with appropriate food. Once tamed, you can issue commands to your tames, which it may follow depending on how well you've tamed and trained it. Tames, which can continue to level-up and consume food, can also carry Inventory and Equipment such as Armor, carry prey back to your settlement depending on their strength, and larger tames can be ridden and directly controlled! 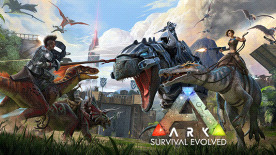 Fly a Pterodactyl over the snow-capped mountains, lift allies over enemy walls, race through the jungle with a pack of Raptors, tromp through an enemy base along a gigantic brontosaurus, or chase down prey on the back of a raging T-Rex! Take part in a dynamic ecosystem life-cycle with its own predator & prey hierarchies, where you are just one creature among many species struggling for dominance and survival. Tames can also be mated with the opposite gender, to selectively breed successive generations using a trait system based on recombinant genetic inheritance. This process includes both egg-based incubation and mammalian gestation lifecycles! Or put more simply, raise babies! By bringing sufficient rare sacrificial items to special Summon locations, you can capture the attention of the one of the ARK's god-like mythical creatures, who will arrive for battle. These gargantuan monstrosities provide an end-game goal for the most experienced groups of players and their armies of tames, and will yield extremely valuable progression items if they are defeated. The mysterious ARK is a formidable and imposing environment, composed of many natural and unnatural structures, above-ground, below-ground, and underwater. By fully exploring its secrets, you'll find the most exotic procedurally randomized creatures and rare blueprints. Also to be found are Explorer Notes that are dynamically updated into the game, written by previous human denizens of the ARK from across the millennia, creatively detailing the creatures and backstory of the ARK and its creatures. Fully develop your in-game ARK-map through exploration, write custom points of interest onto it, and craft a Compass or GPS coordinates to aid exploring with other players, whom you can communicate with via proximity text & voice chat, or long-distance radio. Construct & draw in-game signs for other players to help them or lead them astray... And yet.. how do you ultimately challenge the Creators and Conquer the ARK? A definitive end-game is planned. On the 100+ player servers, your character, everything you built, and your tames, stay in-game even when you leave. You can even physically travel your character and items between the network of ARK's by accessing the Obelisks and uploading (or downloading) your data from the Steam Economy! A galaxy of ARKs, each slightly different than the previous, to leave your mark on and conquer, one at a time – special official ARKs will be unveiled on the World-map for limited times in singular themed events with corresponding limited-run items! Furthermore, you can now design or randomize your own unique 'Procedurally Generated ARKs', for infinite replayability and endless surprises.